Not since the era of Ellis Island have so many immigrants arrived on America’s shores. As in the past, native-born Americans continue to expect immigrants to assimilate; however, in an era of cheap international travel and the Internet, immigrants themselves are now able to keep one foot in their countries of origin, thereby confusing old assumptions about pluralism and American identity. And increasingly it is global religious institutions that enable immigrants to participate in two cultures at once—whether via religious services beamed in by satellite or through an expanding network of global religious organizations. These multicultural religious immigrants, sociologist Peggy Levitt argues in this pathbreaking account, are changing the face of religious diversity in the United States, helping to make American religion just as global as U.S. corporations. In a book with stunning implications for today’s immigration debates—where commentators routinely refer to a “clash of civilizations”—Levitt shows that the new realities of religion and migration are subtly challenging the very definition of what it means to be an American. 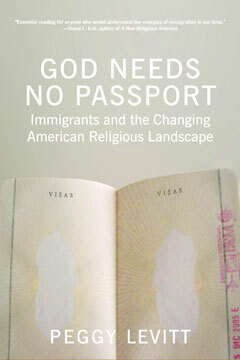 Filled with impressive original research and charts and statistics that “give an excellent overall view of the results of her thorough on-site research” (Library Journal), God Needs No Passport reveals that American values are no longer just made in the U.S.A. but around the globe.